An amyloplast is an organelle found in plant cells. Amyloplasts are plastids that produce and store starch within internal membrane compartments. They are commonly found in vegetative plant tissues, such as tubers (potatoes) and bulbs. Amyloplasts are also thought to be involved in gravity sensing (gravitropism) and helping plant roots grow in a downward direction. Plastids are plant organelles that function in nutrient synthesis and storage. These double-membrane, cytoplasmic structures have their own DNA and replicate independently of the cell. Plastids develop from immature cells called proplastids that mature into chloroplasts, chromoplasts, gerontoplasts, and leucoplasts. Amyloplasts are leucoplasts that function mainly in starch storage. They are colorless and found in plant tissues that do not undergo photosynthesis (roots and seeds). Amyloplasts synthesize transitory starch which is stored temporarily in chloroplasts and used for energy. Chloroplasts are the sites of photosynthesis and energy production in plants. Amyloplasts also help to orient root growth downward toward the direction of gravity. Amyloplasts are derived from a group of plastids known as leucoplasts. Leucoplasts have no pigmentation and appear colorless. Several other types of plastids are found within plant cells including chloroplasts (sites of photosynthesis), chromoplasts (produce plant pigments), and gerontoplasts (degraded chloroplasts). Plastids are organelles that function primarily in nutrient synthesis and storage of biological molecules. While there are different types of plastids specialized to fill specific roles, plastids share some common characteristics. They are located in the cell cytoplasm and are surrounded by a double lipid membrane. Plastids also have their own DNA and can replicate independently from the rest of the cell. Some plastids contain pigments and are colorful, while others lack pigments and are colorless. Plastids develop from immature, undifferentiated cells called proplastids. Proplastids mature into four types of specialized plastids: chloroplasts, chromoplasts, gerontoplasts, and leucoplasts. Chloroplasts: These green plastids are responsible for photosynthesis and energy production through glucose synthesis. They contain chlorophyll, a green pigment that absorbs light energy. Chloroplasts are commonly found in specialized cells called guard cells located in plant leaves and stems. Guard cells open and close tiny pores called stomata to allow for gas exchange required for photosynthesis. Chromoplasts: These colorful plastids are responsible for cartenoid pigment production and storage. Carotenoids produce red, yellow, and orange pigments. Chromoplasts are primarily located in ripened fruit, flowers, roots, and leaves of angiosperms. They are responsible for tissue coloration in plants, which serves to attract pollinators. Some chloroplasts found in unripened fruit convert to chromoplasts as the fruit matures. This change of color from green to a carotenoid color indicates that the fruit is ripe. Leaf color change in fall is due to loss of the green pigment chlorophyll, which reveals the underlying carotenoid coloration of the leaves. Amyloplasts can also be converted to chromoplasts by first transitioning to amylochromoplasts (plastids containing starch and carotenoids) and then to chromoplasts. Gerontoplasts: These plastids develop from the degradation of chloroplasts, which occurs when plant cells die. In the process, chlorophyll is broken down in chloroplasts leaving only cartotenoid pigments in the resulting gerontoplast cells. Leucoplasts: These plastids lack color and function to store nutrients. Amyloplasts: These leucoplasts convert glucose to starch for storage. The starch is stored as granules in amyloplasts of tubers, seeds, stems, and fruit. The dense starch grains cause amyloplasts to sediment in plant tissue in response to gravity. This induces growth in a downward direction. Amyloplasts also synthesize transitory starch. This type of starch is stored temporarily in chloroplasts to be broken down and used for energy at night when photosynthesis does not occur. Transitory starch is found primarily in tissues where photosynthesis occurs, such as leaves. Elaioplasts: These leucoplasts synthesize fatty acids and store oils in lipid-filled microcompartments called plastoglobuli. They are important to the proper development of pollen grains. Etioplasts: These light-deprived chloroplasts do not contain chlorophyll but have the precursor pigment for chlorophyll production. Once exposed to light, chlorophyll production occurs and etioplasts are converted to chloroplasts. Proteinoplasts: Also called aleuroplasts, these leucoplasts store protein and are often found in seeds. Amyloplasts are responsible for all starch synthesis in plants. They are found in plant parenchyma tissue which composes the outer and inner layers of stems and roots; the middle layer of leaves; and the soft tissue in fruits. Amyloplasts develop from proplastids and divide by the process of binary fission. 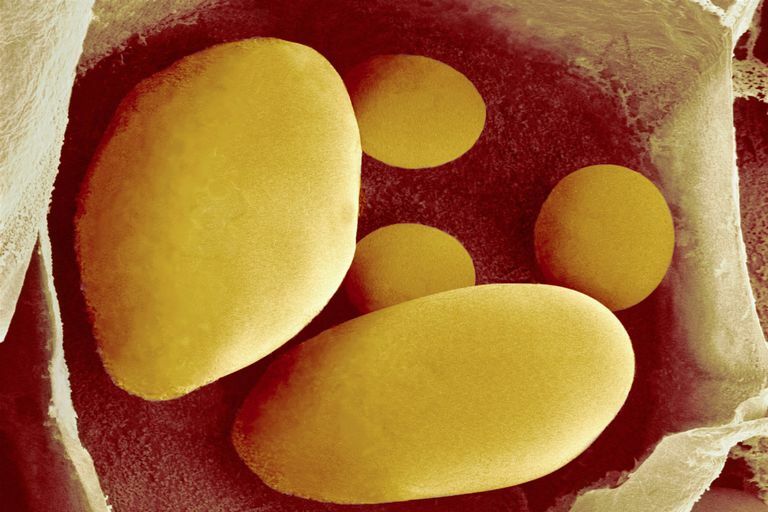 Maturing amyloplasts develop internal membranes which create compartments for the storage of starch. Starch is a polymer of glucose that exists in two forms: amylopectin and amylose. Starch granules are composed of both amylopectin and amylose molecules arranged in a highly organized fashion. The size and number of starch grains contained within amyloplasts varies based on the plant species. Some contain a single spherical shaped grain, while others contain multiple small grains. The size of the amyloplast itself depends on the amount of starch being stored. Horner, H. T., et al. "Amyloplast to Chromoplast Conversion in Developing Ornamental Tobacco Floral Nectaries Provides Sugar for Nectar and Antioxidants for Protection." American Journal of Botany, vol. 94, no. 1, Jan. 2007, pp. 12–24., doi:10.3732/ajb.94.1.12. Weise, Sean E., et al. "The Role of Transitory Starch in C3, CAM, and C4 Metabolism and Opportunities for Engineering Leaf Starch Accumulation." Journal of Experimental Botany, vol. 62, no. 9, 2011, pp. 3109–3118., doi:10.1093/jxb/err035. What's the Function of Stomata in Plant Tissue?